Murphy Research Building viewed from the east. The Security Benefit Life built this for staff housing with four apartments. 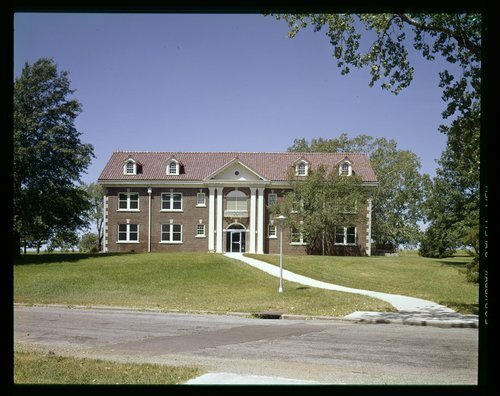 Menninger used it to house their Research Department. Principal Investigators included Robert Wallerstein and the Psychotherapy Research Project; Riley Gardner and Cognitive Control Projects (Equivalence Range, Twin Study, etc. ); Phiipl Holzman and Perception/Cognition Projects (Self-Confrontation, My Voice, Thyroid, etc. ); Harold Voth and the Autokinesis Projects (Phenomenology, Hypnosis, Suicide, etc. ); Riley Gardner and Perceptual Learning Projects, ( ESP Studies); Herbert Spohn and Schizophrenia Studies; Joseph Kovach and Quail Genetics Projects; Elmer Green and Biofeedback, Magnetic Field Studies (Copper Wall), and Healers; Howard Shevrin and Studies of the Unconscious (Poetzel, Rebus, Hypnosis, etc. ); Nancy Shand and the Infancy Project; Joseph Sargent and Biofeedback Projects (Migraine, Tension Headache,etc. ); Joseph Hyland and Breast Cancer Counseling Project; James Taylor and Social Psychology Projects (Urban Renewal, Tornado), Multitrait-Multimethod Scaling Method; Fred Glixman and Parent Interaction Project; and Steven Fahrion and Biofeedback and Brain Wave Studies (Hypertension, Immunology, Cancer, Addiction etc. ).